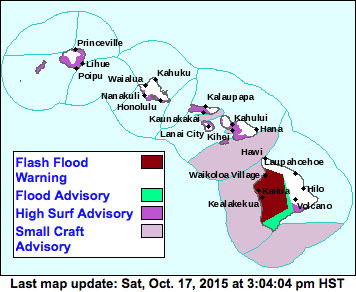 The National Weather Service in Honolulu has issued a flash flood warning for Hawaii Island until 6 p.m. Saturday (Oct 17). At 2:53 p.m. weather radar indicated nearly stationary thunderstorms producing heavy rain and flash flooding over the leeward and interior sections of Hawaii Island. Radar was showing rain falling at up to three inches per hour. Locations in the warning include, but are not limited to, Kailua-Kona, Captain Cook, Honaunau, Waikoloa Village, Puuanahulu, Kalaoa, Waikii and Saddle Road Junction. This warning may be extended beyond 6 p.m. should heavy rains continue. A flood advisory is also in effect until 4:30 p.m. in the areas of Kealakekua, Naalehu, Pohakuloa Training Area and Hawaiian Ocean View Estates.